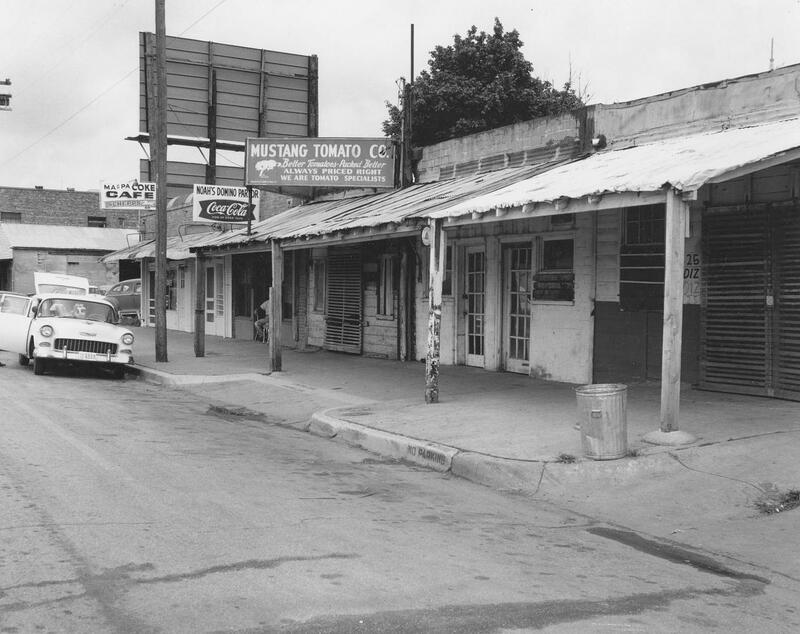 Above, a photo showing the block of Cadiz Street between what was then the S. Pearl Expressway and S. Central Expressway (now Cesar Chavez). The view is southwesterly, with the (oddly placed) billboards facing toward Pearl. I’m sure most people considered such a view urban blight in 1959 when this photo was taken, but (I know I sound like a broken record…), I will always prefer this seedy and run-down version of the farmers market area to the current, relentlessly sterilized, pre-fab, insta-city which took its place. By 1961 this little stretch of businesses had been leveled for a parking lot, which, frankly, was probably more of an eyesore than a ramshackle domino parlor with peeling paint. Below, a photo taken in the same block, about a year earlier. It’s not quite as interesting to look at as the top photo, but it does show that this was a working neighborhood, where vegetable crates frequently spilled into the streets as part of the day’s activities. This part of Cadiz doesn’t exist anymore. Here’s the view from S. Pearl these days, looking east (these businesses would have been on the left). 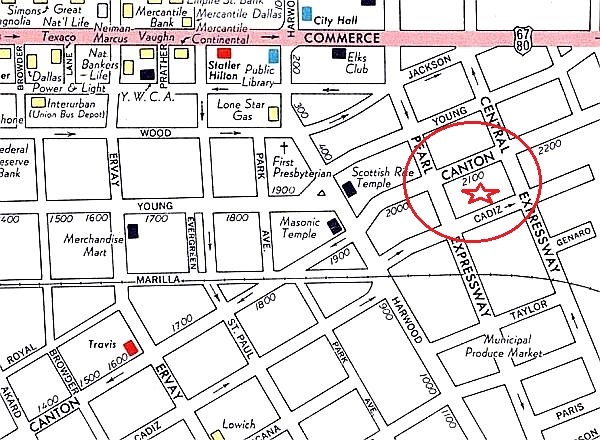 Here’s a map from 1962, when the area was a thriving wholesale and retail produce district. Both photos are from the Dallas Farmers Market/Henry Forschmidt Collection, Dallas Municipal Archives, via the Portal to Texas History; the top one can be found here, the bottom one, here. 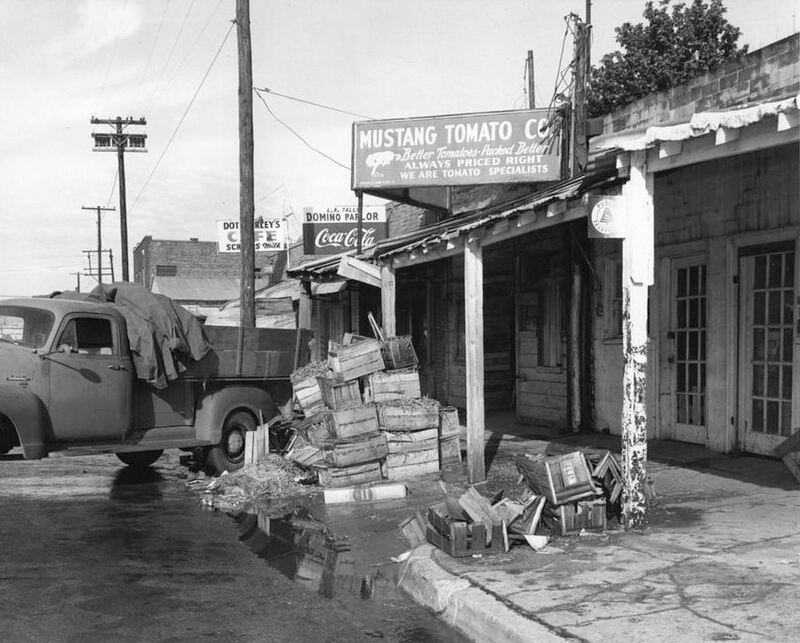 See other Flashback Dallas posts about the Dallas Farmers Market here — every time I see these great old photos I just shake my head and wish I’d been around to see this part of the city when it was at its grittiest.